Sisters, Home Visitors of Mary | Changing people's lives. One at a time. Changing People’s Lives for more than 65 years. Stay Current: Be sure to click Recent Posts for current issues and topics. Click on Upcoming Events for details on future events. Click on Donate/Contact tab to contribute to or contact the Sisters, Home Visitors of Mary. Explore previous postings by clicking on the Months on right side of the desktop screen or bottom of cell phone screen. Sisters Home Visitors of Mary is a vibrant multicultural community that was founded in 1949 with a focus on welcoming newly arriving African-American families in Detroit, Michigan. HVM Sisters walked up and down the streets of Detroit knocking on doors to say Welcome Into Our Church Home – We Are One. We reach out to people in the context of their lives where they dwell in our neighborhoods, currently in Detroit and in Nigeria. We encourage them through respectful conversation and common action to explore goodness, truth and beauty in themselves and in their community. HVM Sisters in Detroit minister in city parishes, serve in food pantries and soup kitchens, organize retreats and discussion groups particularly for the marginalized, assist with couples who marry at Blessed Sacrament Cathedral, coach reading to adults and youths, work in adult care facilities, operate a second hand thrift store for neighborhood purchases, and sing in a metropolitan choir. In Nigeria the Sisters teach in schools, run child care centers, provide religious education to countless squatter villages and outlying areas, visit as chaplains in hospitals and prisons, and run a women’s empowerment business training program. 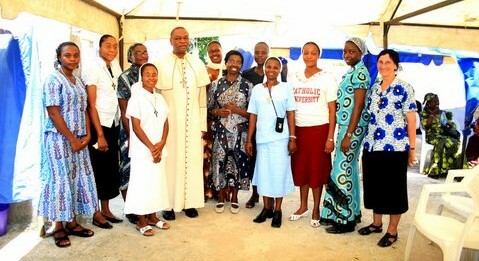 In the city of Gwagwalada the Sisters have established a pastoral institute to form men and women as parish faith leaders. Twenty-five Nigerian women have become Sisters Home Visitors of Mary since two Detroit HVM Sisters planted the seed of our congregation in Nigeria fifteen years ago. We treasure the Word of God in all things, as it is the root and source behind everything we do. God’s Word impels us to spread the Good News through our worship, our programs of faith formation for children and adults, and our service to those in need. We extend a warm welcome to you who seek the Lord. Spirituality: Our ministry and the culture of those with whom we live and work shapes our prayer life. Our spirituality calls us to be deeply aware and manifest the redeeming love and indwelling of the Father, Son and Holy Spirit, uniting us to themselves and to one another and to all people. Our prayer is rooted in the rich font of the Catholic Church, e.i. Scripture, the Eucharist. Mary inspires us to live with grateful joy, a spirit of the anawim and openness to the Spirit.